A delicious way to start a meal! A delicious way to start a meal! Shell, devein and dry shrimp (leave tails on). Heat a large skillet over medium heat, add butter. When foaming subsides, raise heat to high and add shrimp in single layer. 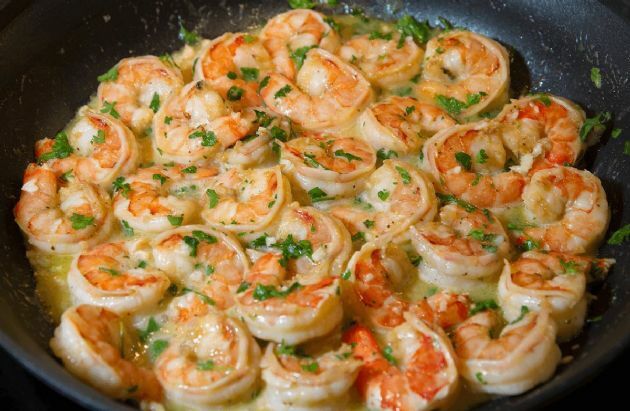 Cook shrimp for one minute. Turn shrimp over and cook for two more minutes. Transfer shrimp to a serving bowl. Return the skillet to medium heat, add vermouth and lemon juice. Scrape any browned bits from bottom of pan with wooden spoon. Boil liquid for 45 seconds, then add the zest and parsley to the sauce. Pour sauce over shrimp and toss to combine. Recipe submitted by SparkPeople user DSTENORE.